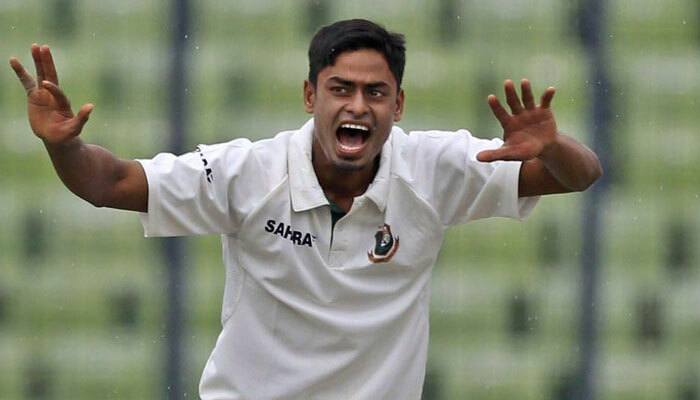 SYLHET, Bangladesh: Taijul Islam claimed 11 wickets to lead Bangladesh´s fightback in the first Test against Zimbabwe on Monday, but the hosts still need a record chase to win in Sylhet. Bangladesh dismissed Zimbabwe for 181 in their second innings with Taijul returning impressive bowling figures of 5-62. His effort boosted Bangladesh after they were bowled out cheaply for just 143 in response to the tourists´ first innings total of 282 runs. The hosts were 26-0 in their chase of 321 when bad light stopped play on day three at the Sylhet International Stadium. Opener Liton Das and Imrul Kayes remained unbeaten on 14 and 12 respectively as Bangladesh head into day four with another 295 runs needed to re-write the record books. No team has ever had to chase so many runs to win a Test match in Bangladesh. Bangladesh´s highest successful chase at home is 101 against Zimbabwe in 2014. Zimbabwe though were on their way to a bigger lead after reaching 165-6 at tea, but spinners made a quick work to pick the remaining four wickets in just 3.4 overs after the break. Off-spinner Mehidy Hasan and left-arm spinner Nazmul Islam complemented Taijul with 3-48 and 2-27 respectively. Taijul, who also claimed 6-108 in the first innings, fittingly claimed the final Zimbabwe wicket when he trapped Tendai Chatara leg-before. Bangladesh had to wait until the ninth over of the day for their first breakthrough when off-spinner Mehidy Hasan bowled Brian Chari for nine. Chari was earlier dropped by Nazmul Islam off Abu Jayed at backward point on one after he resumed Zimbabwe´s innings on 0-1 with Masakadza. Imrul took a stunning catch at mid-on as Taijul dismissed Brendon Taylor for 24. Masakadza and Sean Williams then batted with caution to deny Bangladesh further success in the opening session. Mehidy trapped Maskadza leg before for 48 after the break before Taijul took control of the innings. He bowled Williams for 20 and then dismissed Peter Moor for a duck in the next ball. Raza, who made a quick 25 off 30 balls, was unable to survive long as Taijul spun one beautifully to uproot his middle stump and complete his maiden 10-wicket haul.